GCell is the first choice for electrical engineers and product designers seeking a indoor Dye Sensitized Solar Cells (DSSC) that are flexibleÂ and boast superior low light performance. With GCell any light source becomes an energy source. GCell can be incorporated into a wide range of indoor and portable products to provide power for refuelling rechargeable batteries, super capacitors or directly powering almost anything that uses a AA-cell disposable battery. The output of GCell, like all other indoor solar cells, will differ depending on the light source to which they are exposed. This is because photo electric conversion efficiency (PCE) changes with the respect to the wavelength and intensity of the light. The absorption spectra of GCell is 390-700 nm. The peak absorbance is between 500-550 nm. GCell is constantly energy scavenging even with indoor low light conditions. Illumination indoors is usually specified in Lux. This unit of illuminance is based on the spectral response of the human eye ie the visible light. 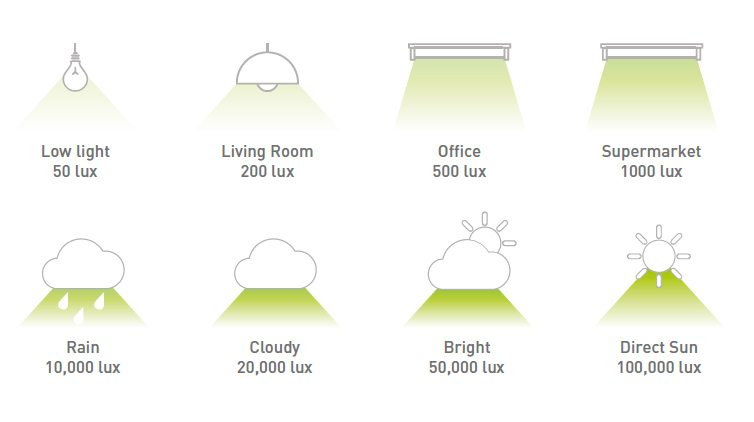 GCell works in a wide range of indoor lighting conditions from low light conditions (50 lux) to dimly-light living rooms (200lux) through to brightly-lit supermarkets (1000lux). GCell has been attuned to indoor lighting conditions to provide improved power density. The spectral response of GCell is similar to that of the human eye, infrared and ultraviolet have little effect to its energy harvesting capabilities. Indoor light is already diffused particularly with florescent tubes, so in affect the light doesnâ€™t have an angle. Due to the diffusion there is no real effect on performance based on the angle and only the light level on the surface will affect the performance of GCell. 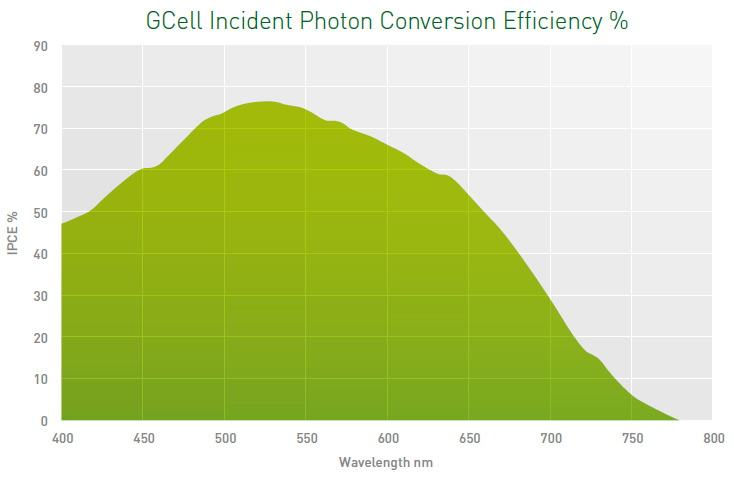 Even in outdoor lighting conditions the photoelectric conversion efficiency (PCE) of GCell has no dramatic changes according to the light angle. Adjusting the incident angle from 60Â° to 90Â° will not reduce the efficiency by more than 5%. A Texas Instruments whitepaper identifies four potential energy harvesting technologies and suggests that solar cells are likely to be the preferred choice for most applications. The analysis compares thin film solar cells, including dye sensitized, organic and inorganic; namely G24â€™s Dye Sensitized Solar Cells (DSSC), Konarkaâ€™s Organic (OPV), Amorphous Silicon (a-Si). The paper states that the majority of portable and mobile devices are primarily used in indoor applications and therefore assess which solar technology is the most appropriate for energy harvesting applications by measuring their relative performance under low light conditions. In a 200lux test procedure, described as family room lighting conditions, the paper reveals that the average indoor lighting is typically less than 500 times lower than the outdoor conditions that the majority of solar cell characterization studies are reported (1000Wm-2). The Texas Instrument analysis demonstrates that DSSC shows higher power density across indoor conditions relative to a-Si and OPV solar cells. The whitepaper concludes that DSSC under indoor conditions for energy harvesting applications is a better candidate than a-Si and OPV in terms of maximum power density. Click downloads get a copy of the Texas Instruments white paper.